“By all that is Holy exclaimed Ludo, its a Mummy, He threw his torch at the creature, turned and pushed Hasan, quick back up the stairs, we should fight this thing in daylight”. “For Feldard!” Stephan bellowed as he engaged the musty undead with is sword. Being the faster of the two, Stephan was about to land two strikes on the mummy. He felt the blows were sound but the impact of it felt strange and did not have the devastating effects he’d hoped. This momentary surprise cost him dearly as the mummy grabbed at his sword–no blood, no pain–and wrenched it from his grasp. The blade clattered across the stonework. Faster than expected, the mummy finished its attack with a roundhouse pummel that, like Feldard, sent Stephan sprawling. It was all he could do to roll to his feet. Unshielded–somehow, his shield had come loose and now lay useless on the flagstones. 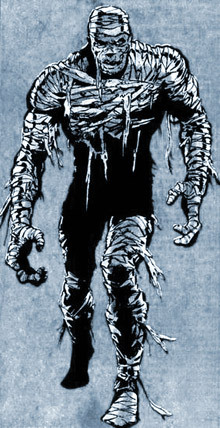 In one fell swoop, the mummy had managed to completely disarm him. He was grateful, laughingly, to still be wearing his chainmail. miklos didn’t wait to seeHalav’s power in the situation. Miklos cast a web spell and tried to snare their frightening foe.